Catherine Bell (born August 14, 1968) is an American actress known for her role of Lieutenant Colonel Sarah MacKenzie of the television show JAG from 1997 to 2005. Currently she stars in the Lifetime Television hit series Army Wives as Denise Sherwood. Bell was born in London, England, the daughter of Mina, a personal assistant and nurse, and Peter Bell, an architect. Her mother is Iranian and her father Scottish. The idea behind this marathon—or what will actually be a series of marathons—is that I will watch 1 movie per day for an entire week with the chosen celebrity. I am not saying I will do one of these marathons every week... but it is something I will do hopefully fairly often. As you can see for the first week I chose the JAG & Army Wives star... the always lovely Catherine Bell. I have been a fan of her's since the very first time I saw her in the second season of JAG. This marathon will be running from today, Saturday the 17th through Friday the 23rd. So I will be watching 7 of the above through-out the next week. With 9 titles there... 2 of which is small parts I will probably skip the two where she has small parts. ...so the review won't be up until later this evening. For me this would be an extremely short Marathon. I only have her in one title and this is on my wishlist. She isn't even acting in it, she's only the body double for another much more famous actress. I know she was the body double for Isabella Rossellini in Death Becomes Her. Though I don't have that one. I have about an hour left on the miniseries I am watching today.... so review will be up soon. From the director of X-Men and a producer of Independence Day, comes a sci-fi event so big, it's a phenomenon. Experience the thrills and heart-pounding suspense of the greatest legend of our time as a team of specialists races to solve the mystery of why an alarming number of cargo ships are disappearing into the Bermuda Triangle. But as every clue only deepens the mystery, the truth they uncover is far more bizarre than the myths used to cover it up. This is my second time watching this mini-series. I was hoping this time I would enjoy it a little more then I did the last time. But going by my rating in profiler... and my notes on the last time I watched it.... I feel pretty much the same. It's not a bad film... I did enjoy it. But I still felt unsatisfied when it was over. I think... at least in my opinion... they went with an easy out at the end... but then added a bit of a twist to that easy out. Which was ok... but I just felt like there should have been more to it. As usual.... I did enjoy watching Catherine Bell in this one. But surprisingly I wasn't as impressed with Lou Diamond Phillips this time. I don't know... just felt like his heart wasn't in it or something. What can I say? 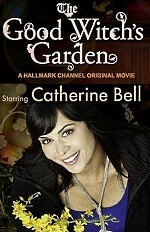 I really enjoy this Hallmark Channel Original movie. I caught this movie for the first time on cable a while back... enjoyed it so much that I went ahead and grabbed the DVD. I grabbed the DVD just over a year ago (Feb. 8, 2011)... and this is my third time watching the DVD. And I enjoy it just as much now as the first time I watched it. I really like the character of Cassandra Nightingale (The Good Witch) and the lovely Catherine Bell did a wonderful job in the role. I couldn't imagine anyone doing it better. If there is anything I didn't care for though... it would be that the ending felt like it was settled a little quickly and easily. But that didn't really take away from the movie for me. Unfortunately this DVD release has no extras what so ever. Also unfortunate is the fact that none of the three sequels has made it on DVD yet. Luckily I have them all recorded until they are (hopefully) released. Real life got in the way of my DVD watching today... so to make up for it I will be watching 2 titles tomorrow. This is one that I recorded and burned to DVD myself as it hasn't been released yet. But I am hoping to see a DVD release of it before too long so I can junk this recording. I enjoyed this first sequel just as much as I did the original movie. It has enough sub-plots to keep the story moving and interesting... while limiting it just enough so that there isn't too much going on. I really enjoyed the main storyline of the guy trying to swindle Grey House from Cassie. Once again Catherine Bell was great as Cassie. The more I see her in the bigger fan I become. Once again this has not yet been released officially on DVD. It is one that I made off my own recording. This sequel is actually known under 2 different titles... The Good Witch's Wedding (as is in the opening credits) and The Good Witch's Gift. It is the third movie in the series. While I still enjoyed this one very much. It wasn't quite as good as the previous two. Almost but not quite. It is a good mixture between a wedding and Christmas storyline. As with the other sequel I hope to see an official release on DVD before too long. A young witch visits her cousin in a small town during a heated mayoral election race. Her kind-hearted cousin, the town’s beloved “good witch” and newlywed with two teenage step-kids, is running for office, but must keep her family from falling apart when their visitor uses her magic to put them—and the whole town—under her bitter spell. 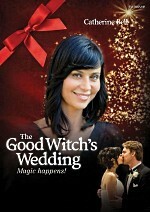 This is the most recent of the Good Witch TV Movies. Once again this is off a Recording as there is no DVD out for it yet. It is another very good installment to the series. This is the second time I watched this one. Once when it originally aired and now. I enjoyed it just as much this time as I did the last time. Though I did miss seeing the kid's grandfather in this one. He was a main character in all three of the previous movies... but not in this one at all. Not even mentioned. The Good Witch series of TV Movies has become pretty much a tradition Every Halloween for the last four years on the Hallmark Channel. I haven't heard if they will be doing another one this year or not. But I hope that they do. This is one of my favorite TV Movies I have found so far. This came up as a recommendation at Amazon when I ordered The Good Witch... and when I watched the TV Spot on Youtube I knew I had to see it as it dealt with the supernatural as Michael (Catherine Bell), the 911 operator got ghostly calls from a little girl. This is a made for TV movie that originally aired on Lifetime on January 6, 2007. I found that this movie looses very little with repeat viewing... I enjoyed it just as much today as I did the first time I watched it. And this is the third time I have watched it in the year that I have owned it now. Definitely one I feel comfortable recommending. This is a movie I always enjoyed. I have watched it multiple times since I got the DVD... but for some reason this is the first time I seen it in a couple years now. I know Jim Carrey can be hard to take at times... but I seem to always enjoy him... and this one is no exception. Of course Jennifer Aniston is good as well. 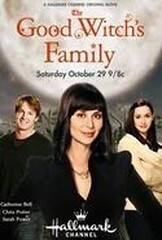 Catherine Bell plays one of the news anchors. She is of course good as well though her part is a little smaller then I would have liked to of seen. It isn't a small part... but I would have liked to seen more of her. Then there was \Morgan Freeman who played God which I thought was a great choice.